John Staples, Marquess of Ragsdale, once a young man of purpose and promise, has over the decade since he inherited the title become a drunkard who lives a life of indolence and indulgence with little thought to his responsibilities. The only strong emotion that he can summon is hatred of the Irish. It was during a fight in Ireland that he lost one eye and saw his father killed by an Irish mob. He deals with his guilt over his inability to save his father by drinking himself into a stupor deep enough to blot out his memories. He is not pleased when the visit of his American cousins, Robert and Sally Claridge, requires some exertion on his part. Robert is to be enrolled in Ragsdale’s own college at Oxford, and Ragsdale’s mother will introduce Sally to the ton and find her a suitable husband. Emma Costello is the Claridge’s indentured servant who has accompanied the brother and sister to London to serve as Sally’s maid. Ragsdale is initially impressed by Emma’s dignity and a degree of knowledge rare in a servant, but when he discovers that she is Irish, he dismisses her as worthless. Even so, when Robert, who is as addicted to gambling as Ragsdale is to alcohol, attempts to offer Emma’s papers of indenture as a stake in a game during which he has already lost all his money as well as all of Ragsdale’s ready funds, Ragsdale’s essential decency will not allow him to ignore the situation. He interferes, offering his two high-bred horses in place of Emma. Ragsdale is then the owner of Emma’s indenture. One night when Ragsdale is so drunk he can reach his room only with Emma’s help, he asks her to reform him. Emma draws up a contract and persuades the drunken Ragsdale to sign it. She will reform him as repayment for the two thousand pounds (the cost of the horses) he paid for her indenture and thus earn her freedom. Emma is no ordinary servant. She is a beautiful, cultured, educated woman whose strength has been tested by the losses she survived. She has no more love for the English than Ragsdale does for the Irish, and her reasons are at least as just as his. Nevertheless, she is determined to carry out the reform of Lord Ragsdale. She secures the help of his mother and begins her program of reform by ending Ragsdale’s access to alcohol. She pays his bills, dismisses his mistress (but only after befriending her and devising means for the woman to respectably earn her living), and she oversees Ragsdale’s makeover into an acceptable husband for a proper wife, Miss Clarissa Partridge. During the process Emma and Ragsdale become friends. He shares with her the horrors that have tormented him for ten years, and Emma eventually shares with him her own horrific tale of torture and loss. Friendship turns to love, but neither Emma nor Ragsdale have any illusions about their future. There can be no shared future for an English marquess and a formerly indentured Irish servant, no matter her origin. From the time I first read Carla Kelly’s earliest traditional Regencies back in 1989-1990, I have sung her praises to anyone who would listen to me. When I encounter another reader who loves Carla Kelly’s books, I add a name to my tribe. My print copies of the fifteen trads she wrote between 1989 and 2002 have been reread until the covers are tattered and the pages are loose. The anthologies that include her novellas have fared no better. I was elated when her books became available in digital versions in 2012. I was thrilled to have Kindle copies of Miss Drew Plays Her Hand, Libby’s London Merchant, One Good Turn, and others, but I had to wait two years to add my #1 favorite Carla Kelly book, Reforming Lord Ragsdale to my digital collection. I have reread it once a year since then. We romance readers take our HEAs for granted. Rare are the books that make us doubt them, but Kelly casts doubt in this book. The power of the story she weaves is so great that on the tenth reread, my heart still leaps into my throat as I read of the plans for Ragsdale’s June wedding and of Emma’s emigration to Australia. And the final five pages always leave me blissful, with tears in my eyes and a smile on my face. 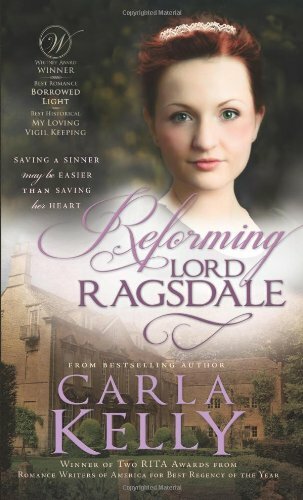 If you think traditional Regencies are formulaic or lacking in sexual tension, you should read Reforming Lord Ragsdale. It just might send you searching for more Carla Kelly books. If you need more recommendations, I have a list. I am not familiar with this author but thank you for putting her on my radar - sounds like something I would enjoy. This jogged my memory. I remember reading this sometime ago, and I really did enjoy it. I must now look for other books by this Author. I haven't read this author, but I keep hearing good things about her books. I'll have to check out her backlist. I just posted over on Goodreads that I'm in a reading slump. I believe I purchased this digital copy as soon as it became available. I remember reading this for the first time years ago (at your recommendation) and loving it. Looks like it's time for a re-read. Thanks, Janga! Thank you, Janga! One more must-read book to add to my mountainous reading queue. You are absolutely right. Ms Kelly has created such wonderful stories. I have saved the paperbacks I have and rereading is of course part of the deal. Thanks for this review. This is one I have not read. I read this years ago, and loved it, but forgotten it. I remember how many of Carla Kelly trad regencies are perfect gems. Thanks so much for bringing this up again. I think my favorite of hers was "One Good Turn."